We visited Max's neurologist today, a doctor who manages to be warm and straight-shooting at the same time. Early on in Max's life, these visits would fill me with dread, because I hated the part where the doctor would measure Max's head. Max has microcephaly (a too-tiny head) from the brain damage, and I didn't want to hear that his head was barely growing. I've gotten past that worry; Max's head is still small, but it's grown, and that mop of hair sure helps! Like this doctor has always said, head size and MRI photos don't tell you everything. We need to keep our eyes on what Max is doing. Oh, and the EEG test for absence seizures? Negative. Max stares into space sometimes, period. It's not a medical problem, though I understand why the nurses at school were concerned—it's easy to think that Max's quirks are neurological issues. 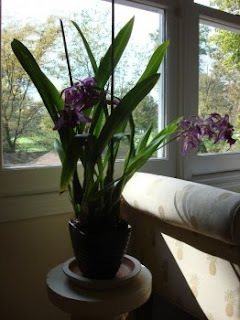 Take, for example, his recent obsession with the color purple. Yes, I asked his neuro about that. At bedtime, Max points to the flowers on the plant in our bedroom. 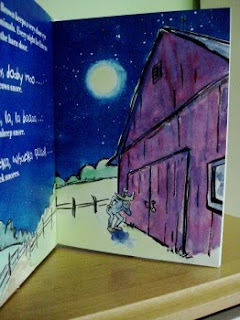 He looooves Harold and The Purple Crayon and squeals when we're reading Dooby Dooby Moo and we get to the page with a purple barn. He's constantly gesturing at our driveway and saying "Ur-ul!" "Max, you want us to get a purple car?" I ask, and he says "YES!" And then a few minutes later, he gestures at the driveway again. Sabrina, ever the wily four-year-old, is trying to use Max's purple obsession to her advantage. She wanted to watch Spongebob Squarepants the other day (tragically, she continues to like that show), but Max said no. "Max, Spongebob has purple in it!" she told him, but he was too smart to believe her. Anyway, the neuro says that Max's conversations about purple are simply his way of communicating. He's pleased with himself that he can say purple, so he keeps saying it. Like any other kid, Max has a favorite color. And it's purple. 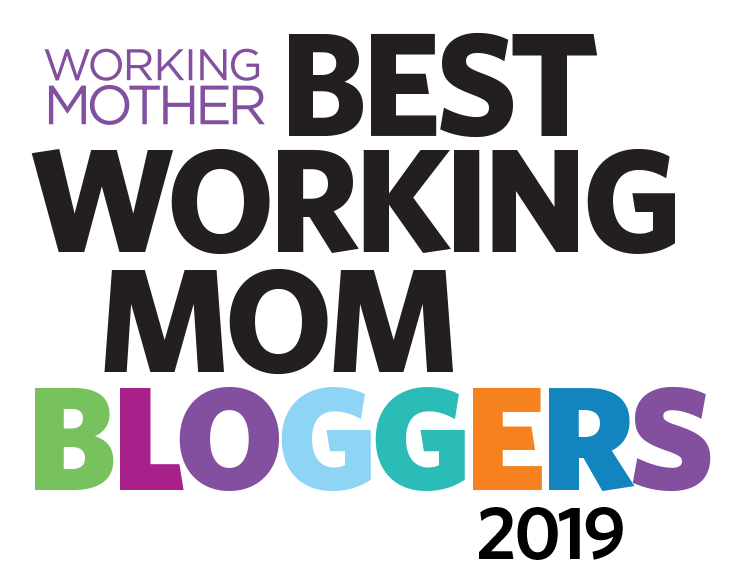 In case you didn't know, voting for Best Blog (I'm a finalist!) is still open at The Bump, you just have to scroll down and leave a comment, in purple. That is way too funny. Gabi is OBSESSED with purple right now too. Even painted her room part purple (not all purple just three walls part way up from the wainscot up with a lilly lavender). too bad we didnt' live closer we could have playdates and they could be purples obsessed together haha. Anyways.. That is beyond excellent news about Max not having absent seizures!!! :) I'm so glad to hear it. Great news on Max! Little Dude loves purple also! CONGRATS on winning the award on the bump! 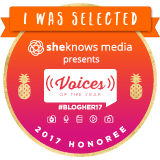 Quite a few of the blogs I love won their category, but I voted for yours as the best overall!! Thanks for the great posts! Ha! My momma LOVES the color purple (not the book or film, the actual color!) 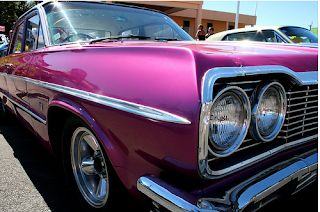 ... it's her favorite color to wear, her favorite color for bric-a-brac...if she could have a purple car, she would!! I am so glad that Max of the Fabulous Hair is doing well both in terms of head growth AND a negative on the seizures. That is such good news! I wonder if that stem cell procedure is doing something to his neural pathways, and Max is staring off into space because he is thinking along those "new lines!" And I'm glad I'm not the only one who has a "Too Much Spongebob" attitude. I've got a couple of swains for Sabrina who are in the Squarepants fan club and don't need purple to be persuaded! Let me go do some voting and comment leaving, now! I'm glad life is good. It's getting better every day, I think. First Off, GO MAX, for picking the BEST color!!! 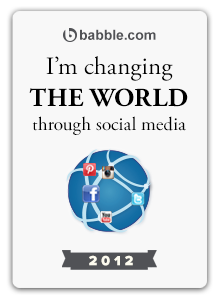 I am honored to share it with him!! Second, Thanks for mentioning the small head size. That was in a report from the orphanage about Jeremiah. I guess maybe that is common with children with cp? Jeremiah is said to have severe cp so I am not sure what the future holds but I am thankful to have internet contacts with other mammas!! Purple is a great colour Max! I am with you ;-). BC's fave colour is YELLOW. I don't really get that! 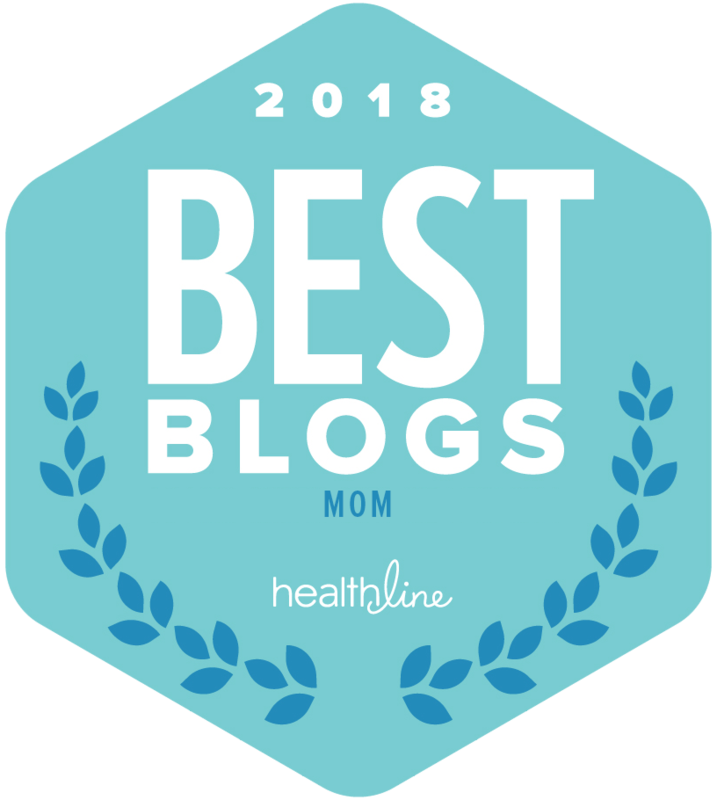 Great news on the EEG results!!! So happy the EEG was negative. Every little bit helps, huh? Purple is a cool color. Purple is my son's second favorite color, after yellow! For a long time, when anyone would ask about what color balloon or candy he wanted, he would always say pink - so I have to say I am much happier with his current choices. Silly, I know, but there it is! Great news about the seizures. Isn't funny how we can blame almost anything on our kid's special needs? I went to a birthday party today and was pleasantly surprised to see that mine was not the only child overwhelmed by the crowd.